Click below to see highlights from our 2013 BSMPG Summer Seminar featuring Val Nasedkin. A quick video to remind us why we all put so much blood and sweat into our work - see you at BSMPG, where innovators meet. Join the INNOVATORS in Sports Medicine and Performance Training at the 2013 BSMPG Summer Seminar - May 17 &18 in Boston MA. They say the early bird gets the worm, but at BSMPG there are no worms - just the best sports medicine and performance professionals from around the world! See speakers such as Mark Lindsay, Joel Jamieson, Charlie Weingroff, Stu McGill, Adriaan Louw and Marco Cardinale all under one roof followed by our incredible social Friday night and the best sports science, equipment and nutrition suppliers in our vendor area throughout the two days. Stu McGill Workshop Added to 2013 BSMPG Summer Seminar!! BSMPG is pleased to announce the addition of a small group workshop at the 2013 BSMPG Summer Seminar led by professor Stu McGill. Stu McGill is set to deliver his keynote presentation the morning of the 18th to all attendees with his workshop scheduled for the afternoon. Attendees interested in attending this workshop must sign up and register separately for this portion of the program. This small group session is sure to fill up FAST! Sign up today to avoid disappointment. 56 days until the start of BSMPG 2013 - See you in May!!! Remember: Book your HOTEL TODAY!!! Workshop: Hands-on Demonstrations. This small workshop will have a limited number of seats and will take place in the afternoon of the 18th. Additional registration is required. 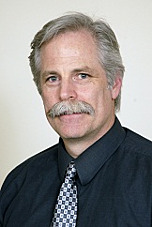 Stuart McGill is a professor of spine biomechanics at the University of Waterloo. He has been the author of over 200 scientific publications that address the issues of low back function, injury mechanisms, development of evidence-based rehabilitation and performance exercise, diagnosis, and the formulation of injury avoidance strategies. As a consultant, he has provided low back expertise to various government agencies, many corporations, elite athletes and teams from many countries, and legal firms. Working at the interface between basic foundational science and clinical practice, he is one of the few scientists who is regularly asked for consult by the medical community regarding particularly difficult back cases, and by world-class athletes from around the world. See Stu and other top Sports Medicine and Performance professionals from around the world at the 2013 BSMPG Summer Seminar - May 17&18. Remember: McGills Workshop has a limited number of seats. Register today before this once in a lifetime opportunity fills up. Learn from Stu McGill in a small group workshop setting at the 2013 BSMPG Summer Seminar. We all have a different injury history influencing which tissues may need sparing, different body segment length ratios affecting leverage advantages, different hip socket depths that determine the depth of the squat before the pelvis tucks stressing the lumbar discs, etc. What is best for one person will not be best for their training partner. Here is a drill I use that will help all lifters set-up their pulls, despite their individual differences. We call it the short-stop squat. If you know American Baseball, you will catch on very quickly. Begin with the feet apart. Try a few knee bends and adjust the internal/external rotation of the hip, to get perfect knee and ankle hinge tracking. 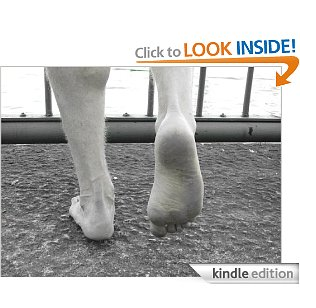 Now look at the turn out of your feet. Remember this angle and start in this position. Now to start the drill, stand tall and place the hands on the top of the front of the thighs. Make a “V” between the thumbs and the finger. Keeping the arms straight, push the hands down the thighs, only hinging about the hips—do not allow the spine to bend. Stop as the hands reach just above the kneecap and robustly grab around the knee. This is the short stop posture. Check the position of the knee. If you drew a vertical line down from the knee it will fall between the balls of the feet and the heels. This ensures that the hips are well behind. Play with your balance so you feel the centre of pressure from the ground in the middle of your feet. Enjoy carrying the weight of your upper body down the arms and onto the thighs. Focus on the curves in your torso – are they the same as when you were standing? If they are you have good form. If they are not, adjust them back to the natural curves. To lift from this position, many will shrug. You will not. You will perform the “anti-shrug” by compressing the shoulders down into your torso with co-contraction of the pectoral and latissimus dorsi muscles. The World Leader in Athlete Monitoring is HERE! 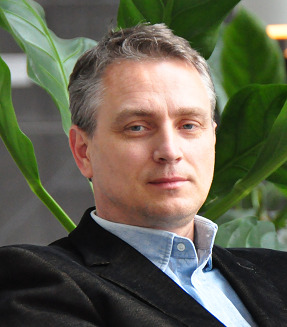 BSMPG is proud to announce the addition of Val Nasedkin as a speaker within the popular Sports Fusion (formally Hockey & Basketball Specific Training) Track at the 2013 BSMPG Summer Seminar - May 17th and 18th, 2013! Val joins Dr. Stuart McGill and Marco Cardinale for this weekend event along with the leaders in Performance Training and Sports Medicine professionals from around the world! With the greatest speaker line-up assembled to date, the 2013 BSMPG Summer Seminar will be the WORLD'S most sought after Sports Medicine & Performance Seminar to date!! Be sure to save the date now - hotels will fill fast with this event along with normal Boston traffic so start making plans now! See you in Boston this May!!! Val Nasedkin, a former decathlete at the national level for the former Soviet Union, is the co-founder and technical director of Omegawave, a pioneering company in the field of functional preparedness and readiness in athletes. He has been a guest lecturer on the principles of training at numerous sport science and physical education universities around the world, and frequently acts as a consultant to Olympic committees, sports federations and national and professional teams for various sports including Dutch Olympic Committee, United States Track and Field Olympic Committee, EPL, Serie A and La Liga teams (Medical Staff), Autonoma University (Barcelona, Spain), Duke University (North Carolina, USA) and University of Calgary (Canadian National Sports Center). BSMPG 2013 Summer Seminar - There is NO other Sports Medicine and Performance Training Seminar in the world - PERIOD. Register Today before seats fill up. Remember to book your Hotel room before area college graduations take over. 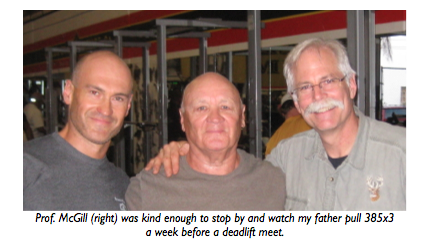 Jumping High: External Focus More Important than Strength? 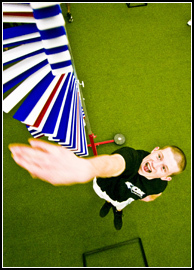 “Zachry had participants perform a jump-and-reach task using a Vertec measurement device (see photo). Participants were instructed to jump straight up and touch the highest rung on the Vertec they could reach with the tips of their fingers. 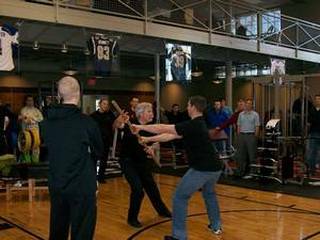 Each participant performed five trials under one of three conditions: control, internal focus, and external focus. For the control condition, no additional focus instruments were given. Under the internal focus condition, participants were instructed to concentrate on the tips of their fingers. Under the external focus condition they were instructed to concentrate on the object to be touched, that is, the rungs of the Vertec. Participants indeed reached higher rungs when they adopted the external focus (on average 4.79 rungs) compared to the internal focus (4.12 rungs) or when they received no attentional focus instructions (4.10 rungs). Also the time they spent in the air was longer under the external (0.491 s) than under the internal focus (0.477 s) or the control condition (0.478 s) Thus a change in the focus of attention significantly affected reach height: Focusing on the object to be touched resulted in more effective performance than did focusing on the finger with which the object was to be touched. Perhaps most interestingly, instructing the participants to adopt an external focus increased jump height above and beyond what participants achieved under “normal” conditions (i.e., control conditions without instructions). These results were recently replicated by Carolina Granados in my lab (Wulf, Zachry, Granados, & Dufek, 2006, Experiment 2). In addition to looking at reach height, Granados calculated the displacement of participants’ center of mass during the jumps. Interestingly, she found not only the greatest reach heights under the external focus condition, but also greater vertical displacements of the center of mass (0.51 cm) compared to those in the internal focus (0.47 cm) and control conditions (0.47 cm). Focus your attention to the 2013 BSMPG Summer Seminar - Where the top Sports Medicine and Performance Professionals meet every year! 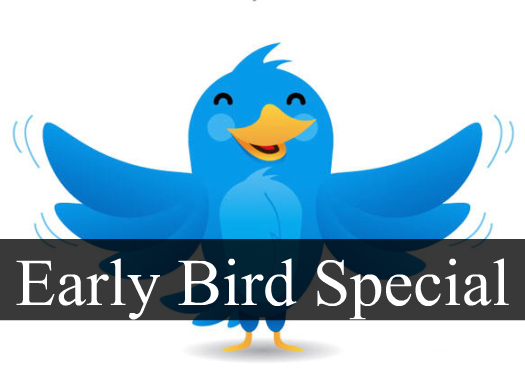 Sign Up before April 15, 2013 and enjoy our Early Bird Pricing! Your Anatomy Teacher Was Wrong - Again! If you were the average student in the average anatomy class, you were taught that the psoas major was responsible for hip flexion and external rotation of the femur. If you were lucky, you may have had a minor discussion regarding its role in lumbar stability. But did your anatomy teacher discuss the psoas as it relates to the diaphram and breathing? 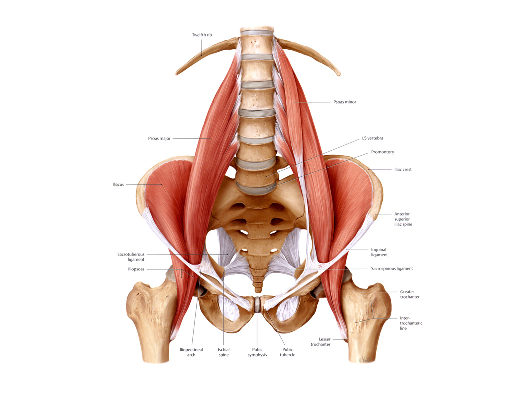 What about the psoas and the pelvic floor? "The fascial relations of the psoas major to the surrounding tissues warrant special attention as these links influence the biomechanics of these interlaced structures. The medial arcuate ligament is a continuation of the superior psoas fascia that continues superiorly to the diaphragm. The right and left crus constitute the spinal attachment of the diaphragm. They attach to the anterolateral component of the upper three lumbar vertebral bodies. The crus and their fascia overlap the psoas major and appear to be continuous with this muscle until they come more anterior and blend with the anterior longitudinal ligament. (8) As the psoas descends, its inferomedial fascia becomes thick at its inferior portion and is continuous with the pelvic floor fascia. (9) This forms a link with the conjoint tendon, transverse abdominus, and the internal oblique. (10) As the psoas major courses over the pelvic brim, the fascia of the posterior fascicles attach firmly to the pelvic brim." Psoas major: a case report and review of its anatomy, biomechanics, and clinical implications by Sajko, Sandy & Stuber, Kent. Journal of the Canadian Chiropractic Association, 2009. Discover what you've been missing and what the leaders in Sports Medicine and Performance already know at the 2013 BSMPG Summer Seminar - May 17 & 18, 2013 in Boston. 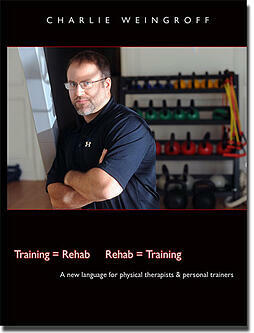 BSMPG is proud to announce the addition of Charlie Weingroff as a speaker within the Sports Medicine and Rehabilitation Track at the 2013 BSMPG Summer Seminar - May 17th and 18th, 2013! Charlie joins Robert Butler, Dr. Alex Vasquez, and Bill Knowles along with keynote speakers, Dr. Stuart McGill, Marco Cardinale, Fergus Connolly, Adriaan Louw and Marvin Chun for this weekend event. With the most thorough and integrated speaker line-up ever assembled, the 2013 BSMPG Summer Seminar will be the WORLD'S most sought after Sports Medicine & Performance Seminar to date!! We are expecting the largest crowd in the history of BSMPG events with speakers and attendees traveling the globe to be in Boston in May of 2013, and thus have already made plans to move our main lecture hall to a newly renovated multi-tier auditorium. See you in Boston next May!!! Charlie is a Doctor of Physical Therapy, a Certified Athletic Trainer, and a Certified Strength and Conditioning Specialist. He was most recently the Director of Physical Performance and Resiliency and Lead Physical Therapist for the United States Marines Corps Special Operations Command in Camp Lejeune, NC. He is also Director of Clinical Education for the Vibraflex Whole-Body Vibration and Andante Medical, the makers of the SmartStep, mobile force plate. He graduated from Ursinus College with a degree in Exercise and Sports Science in 1996, and went on to earn an MSPT in 1999 and DPT in 2010 from the University of Medicine and Dentistry of New Jersey. Prior to returning to his home state of New Jersey in the Fall of 2006 after 12 seasons of professional basketball, he was the Head Strength & Conditioning Coach and Assistant Athletic Trainer for the Philadelphia 76ers in the NBA. Among the highlights of his tenure in Philadelphia was being part of the medical staff that ranked 1st in the NBA in Player Missed Games in the 2005-06 season. Through rehabbing patients, he subscribes to a movement-based approach popularized by the works of Dr. Vladimir Janda, Dr. Shirley Sahrmann, Dr. Stuart McGill, and Gray Cook. In training athletes and clients, he champions the principles of the Functional Movement Screen and sound, evidence-based training principles. Some of the methodologies Charlie is formally trained in include DNS, ART, Dry Needling, Graston, FMS/SFMA, and the RKC. Currently Charlie is training and rehabbing clients of all types at Drive495 in Manhattan, NYC and Fit For Life in Marlboro, NJ. Charlie lives with his wife, Kristen, and dog, Rumble, in NJ. While there are lots of ways to injure a back, the sit-up is an easily preventable one. According to his research, a crunch or traditional sit-up generates at least 3,350 newtons (the equivalent of 340 kg) of compressive force on the spine. The U.S. National Institute for Occupational Safety and Health states that anything above 3,300 newtons is unsafe. Want more awesome McGill resources? Visit Craig Liebenson's site for a complete list of audio, video, and written articles outlining the most up-to-date research on athletic performance and core development. Learn why crunches are hurting your back and why your traditional core exercises are missing the mark when it comes to improving athletic performance at the 2013 BSMPG Summer Seminar featuring Professor Stuart McGill as keynote speaker! Hurry - this seminar will sell out again this year. Discounted prices end December 31st, 2012!